Ornithopod dinosaurs were unique among reptiles in that they could chew their food. Chewing, in which the back teeth move sideways and back and forwards, is normally thought to be a special feature of mammals. We chew our food before swallowing in order to aid digestion: reptiles and birds just gulp their food down. Ornithopods hit on two solutions to the problem, and both of these are different from the mammalian technique (see pp. 292-6). Heterodontosaurus had a rotating lower jaw. The articular-quadrate joint at the back and a special ball and socket joint at the front between the dentary and predentary, allowed rotation as the jaws opened and closed. This mode of jaw rotation provided one solution to the problem of creating an efficient shearing scissor-like cutting movement between the cheek teeth (see illustration (a)). All later ornithopods adopted the other option, of rotating the maxilla, in order to achieve lateral shearing, and this adaptation is said to lie at the root of the great success of the ornithopods in the Cretaceous (Norman and Weishampel, 1985). The hypsilophodontids, 'iguanodontids' and hadrosaurids have essentially fixed lower jaws that simply moved up and down without distortion during chewing, while the side of the skull (maxilla, lacrimal, jugal, quadratojugal, quadrate) as well as attached palatal elements (ectopterygoid, palatine, pterygoid) flap in and out. 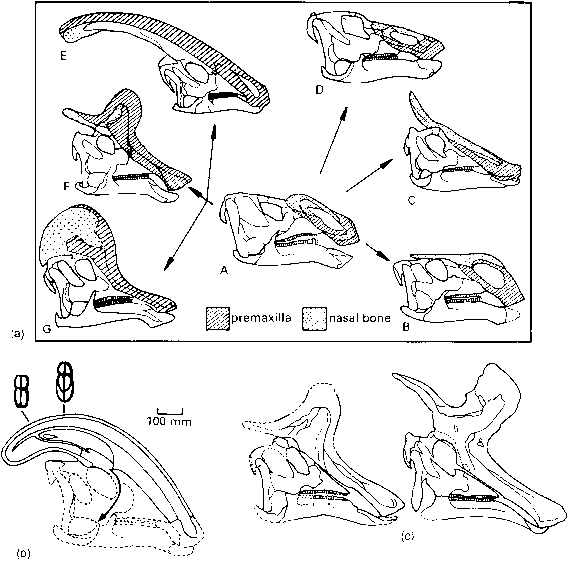 This specialized pleurokinetic hinge (illustration (b)) produces the same lateral shearing effect (illustration (c)) as did the rotating mandible of the heterodontosaurids. Most ornithopods had single rows of teeth on the crests of their jaws. As in all reptiles, teeth were replaced continuously as they became worn out and replacement teeth lined up below the currently functioning teeth on the inside of the jaws. This pattern was taken to an extreme in hadrosaurids, which had a dental battery in which five or six rows of teeth below the jaw line could also be in use (see Figure 8.14(a-c)). Ceratopsians could probably also slice their plant food effectively between powerful shearing jaws, but the other herbivorous dinosaurs lacked chewing adaptations. Perhaps this ability explains the vast success of ornithopods in the Cretaceous after the heyday of the sauropods had passed. of a fast-moving gazelle, especially the very long shin and foot. 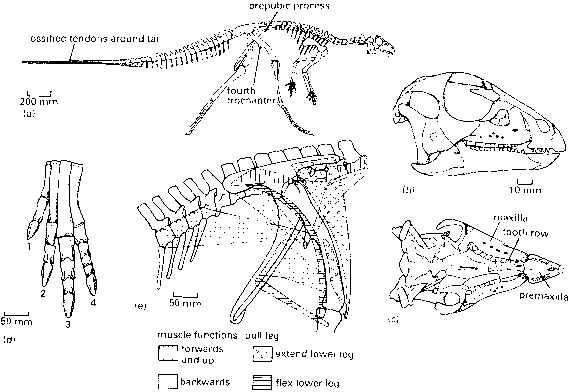 Galton (1974) made a detailed restoration of the muscles of the hindlimbs of Hypsilophodon (Figure 8.12(e)), based on muscle scars and processes on the bones and comparison with dissections of modern birds and alligators (see Box 6.2). The muscle names record the bones to which they attach at each end. They fall into four groups that define their functions in walking. 1 Protractors, muscles that pull the femur forwards and up: iliofemoris, puboischiofemoralis internus (upper part). 2 Retractors, muscles that pull the femur back: pubois-chiofemoralis internus (lower part), caudifemoralis longus and brevis, adductor femoralis. 3 Extensors, muscles that extend the lower leg: ilio-tibialis, femorotibialis. 4 Flexors, muscles that pull the lower leg back: iliofibu-laris, flexor tibialis internus. During a single step all of these muscles came into play. As the leg swung forwards, the protractors pulled the femur forwards and upwards and the extensors extended the lower leg. The foot touched the ground and the power stroke in which the body moves forward was achieved by the retractors and flexors, which pulled the femur and lower leg back respectively. The 'iguanodontids' are a paraphyletic group representing stages of the acquisition of advanced hadrosaurian characters (Sereno, 1986). Iguanodon from the Lower Cretaceous of Europe (Norman, 1980, 1986b) has a horse-like skull (Figure 8.13(a)). In the skeleton (Figure 8.13(b)), the prepubic process is ex panded, the postpubic process is very short and there is a complex lattice of ossified tendons over the neural spines of all vertebrae of the trunk and tail. The most remarkable modifications are seen in the hand (Figure 8.13(c)), in which the carpals and metacarpal 1 are fused to form a single block in the wrist, digit 1 is reduced to a thumb spike, digits 2-4 form a bunch and digits 2 and 3 have small hooves. This hand was clearly used in walking (hooves) and in defence or display (thumb spike). Iguanodon could walk on all fours, or equally well on its hindlegs alone with the tail and the backbone extended horizontally. Another 'iguanodon-tid', Ouranosaurus from the Lower Cretaceous of North Africa, has spines on its back, perhaps supporting a sail for thermoregulation. The snout (Figure 8.13(d)) is elongate and rather flattened. The most diverse, and most successful, omithopod clade were the hadrosaurs or 'duck-billed' dinosaurs of the Late Cretaceous. They are especially well-known from North America (Ostrom, 1961), Central Asia and China, where hundreds of specimens have been found. Frequently, three or four distinct hadrosaurian species are found side by side in the same geological formation and it seems evident that large mixed groups roamed over the lush lowlands rather as closely related antelope do today in Africa. The hadrosaurs are famous for their expanded duck-like bills (Figure 8.14(a, b)) in which both the pre-maxillae and maxillae are flattened and spread out to the sides. The nostrils are long and low and the orbit and lower temporal fenestra are pushed back. The teeth of hadrosaurs consist of long rows of grinding cheek teeth set well back from the front of the mouth and arranged in closely-packed batteries within the jaws (Figure 8.14(c)). There may be as many as five or six rows, each containing 45 or 60 teeth that are formed in the gum tissue at the bottom and move up progressively to the jaw margin where they come into wear. Hadrosaur jaws were used in powerful chewing actions. Wear surfaces on the teeth can be seen in a cross-section through a hadrosaur skull (Figure 8.14(d)) as sloping downwards and outwards. As the lower jaw closes, the cheek region of the skull moves outwards on the pleurokinetic hinge (see Box 8.4) and the plant food is ground with a strong sideways shearing movement. In addition, the jaws move back and forwards a little, giving a further grinding action. Only the top rows of teeth are in use at any time, but they must have worn down quite rapidly because there are so many back-up teeth below ready for use. This advanced and evidently powerful plant-grinding jaw system (Weishampel, 1984) may be one reason for the success of the hadrosaurs. But what did they eat? Some hadrosaur specimens have been 'mummified', preserved with their skin and some internal parts intact. These include stomach contents such as conifer needles and twigs, as well as remains of other land plants, which suggests that the hadrosaurs were terrestrial browsers that stripped trees of their foliage by stretching up on their hindlegs. from their duck bills. They could doubtless have swum, but the skeleton (Figure 8.14(e)) is particularly adapted (Galton, 1970a) for efficient running with the body held horizontally as in other bipedal dinosaurs. The hands bear small hooves on the fingers, so they could also be used in slower locomotion. Hadrosaurs all have essentially the same skeletons and skulls (Figure 8.14), but some have an impressive array of headgear. The premaxillae and nasal bones extend up and backwards to form in some a high flat-sided 'helmet', either low or high, square or semicircular, and in others a long 'tube', spike, or forwards-directed rod (Figure 8.15(a)). The nasal cavities extend from the nostrils into the crests and it was once assumed that they acted as 'snorkels, especially in Parasaurolophus. This is impossible, however, as there is no opening at the top of the crest. There are four separate air passages within the crest (Figure 8.15(b)), two running up from the nostrils and two running back down to the throat region. Air breathed in or out through the nose had to travel round this complex passage system. 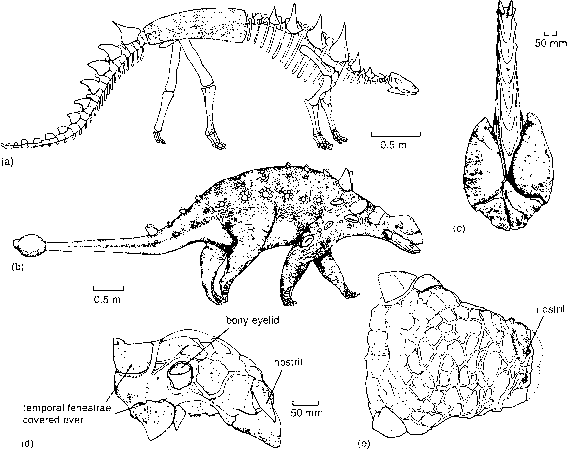 What was the function ofhadrosaur crests? Probably they were used as visual species and sexual signalling devices (Hopson, 1975; Weishampel, 1997), just as modern birds use colourful and often elaborate patterns of feathers to recognize potential mates and to signal their position in dominance hierarchies. Males and females of the same species had rather different crests (Figure 8.15(c)) and the crest was undeveloped in juveniles. Further, Weishampel (1997) has shown that the hadrosaurs augmented their visual display with an auditory one too. The shapes of the air passages within the crests are like musical wind instruments. A powerful snort would create a low resonating note and the shape of the air passages in males and females, and in juveniles, would give a different note. Species differences would have been even more marked. We can imagine the Late Cretaceous plains of Canada and Mongolia reverberating to deep growls and blaring squawks as the hadrosaurs went about their business. ments as well as two supplementary supraorbital elements. Several of the skull bones are further ornamented by lines ofbony knobs. The pachycephalosaurs may have used their thickened heads in butting contests when seeking mates (Galton, 1970b), as is seen today among wild sheep and goats. The pachycephalosaur, a biped, adopted a horizontal-backbone posture during the charge (Figure 8.16(b)) so that the force of the impact ran straight round the skull margins and down the neck to the shoulders and hindlimbs. This system offorce dissipation was paralleled in the dinocephalian synapsids (see p. 126). Confirming evidence for this theory is that the presumed males have thicker skulls than females. Pachycephalosaurs are also characterized by an unusually broad pelvis (Figure 8.16(c)) with gently curved iliac blades that contact the ribs of up to eight sacral vertebrae. This firm attachment of the pelvis may relate to the need to dissipate the forces of head-butting. Pachy-cephalosaurs appear to be allied to the horned ceratop-sians, forming with them a clade Marginocephalia (see Box 8.5), on the basis of several synapomorphies, including the combination of the squamosal and parietal bones in the skull roof to form a narrow shelf that extends over the back of the skull (Sereno, 1986). The Ceratopsia (literally 'horned faces') comprise a relatively large group of about 25 genera known mainly from the Upper Cretaceous of North America (Ostrom, 1966). 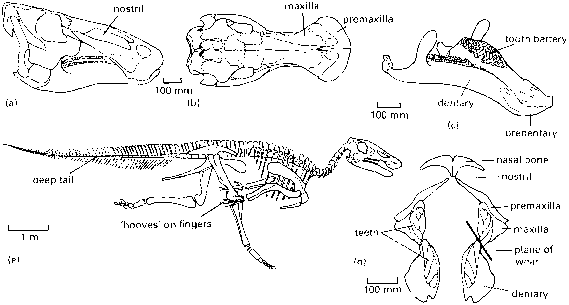 All are characterized by a triangular skull when viewed from above (Figure 8.17(c)), an additional beak-like rostral bone in the midline at the tip of the snout, a high snout and broad parietals at the back. Some early ceratopsians, such as Psittacosaurus from the Lower Cretaceous of eastern Asia (Figure 8.17(a)), were bipeds that had body forms very similar to or-nithopods, but the skull is clearly ceratopsian. Protocer-atops from the mid-Cretaceous of Mongolia and China was a quadruped with the beginnings of a nose horn, a thickened bump in front of the orbit (Figure 8.17(b)). It also shows the second major ceratopsian characteristic, a bony frill formed from the parietals and squamosals (Figure 8.17(c)). The frill probably served as the origin of part of the jaw adductor muscles, the posterior adductor mandibularis muscle, which would have produced a strong biting force. How was the iguanodon formed? When chewing food jaws moves sideways?